You can often make a 3D bar chart communicate more effectively by using different colors. In addition, you can switch among several layouts of the bars to show your data most effectively. 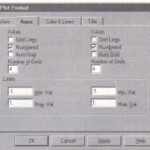 Use the Color & Lines page of the 3D Plot Format dialog box. • None: The bar chart doesn’t show any colors. • Increasing X: The largest values along the x-axis will be in red and the smallest values will be in blue. Intermediate values will range from yellow through green. • Increasing Y: The largest values along the y-axis will be in red and the smallest values will be in blue. Intermediate values will range from yellow through green. • Increasing Z: The largest values along the z-axis will be in red and the smallest values will be in blue. Intermediate values will range from yellow through green. Use the Spacing text box to increase the space between adjacent bars on your plot. This text box measures spacing as the percentage of the size of the grid on which the bars are placed. The default spacing is 20%; the maximum spacing is 99%. As you increase the percentage, Mathcad makes the bars progressively skinnier. 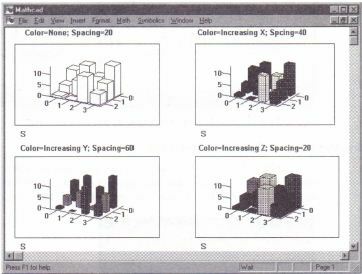 Figure 24-4 shows different spacing for plots of the same matrix. The same bar chart using each of the Color Spectrum options. • Matrix: The bars are arranged exactly as the corresponding numbers in the underlying matrix. • Stacked: All the bars coming from the same column of the matrix are stacked one on top of another. An m x n matrix would therefore appear as n bar clusters, each formed by stacking m bars one on top of another. • Side by Side: All the bars coming from the same column of the matrix are clustered together side-by-side. An m x n matrix would therefore appear as n bar clusters, each of which contains m bars. 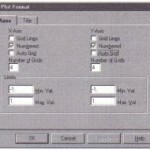 The Axes page of the 3D Plot Format dialog box lets you modify the format of the axes of your plot. Each axis is described by its own set of check boxes and text boxes. Mathcad generates grid lines for bar charts by extending tick marks up and down \the two back planes adjacent to a given axis. Thus, x-axis grid lines represent lines of constant x drawn on the xz plane and the xy plane, the two orthogonal planes whose intersections form the x-axis. 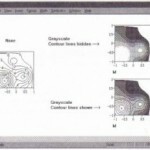 The y-axis grid lines and z-axis grid lines are defined similarly. To choose between using tick marks or grid lines on a selected axis, use the Grid Lines check box for that axis. 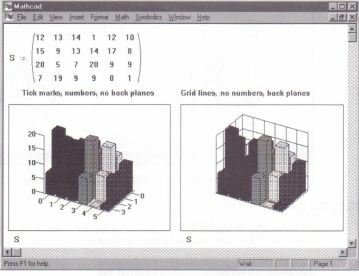 When Grid Lines is checked, Mathcad will extend the tick marks on the selected axis into grid lines on each adjacent back plane. 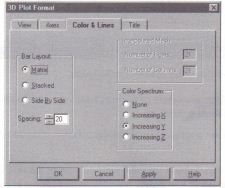 For example, checking this on the z-axis will result in lines of constant z on both the yz and the xz back planes. If you are showing grid lines, you should seriousl y consider showing back planes as well. 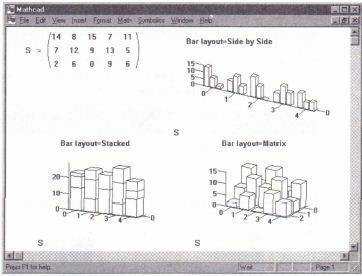 See “Changing your view of the 3D bar chart” an example of a bar chart that uses grid lines rather than tick marks. Using the different options for tick marks. To add or remove numbers for the tick marks on an axis, use the Numbered check box for that axis. Figure 24-6 shows the differences between having numbers on the tick marks and not having numbers. For bar charts, you can have Mathcad automatically select the number of grid intervals on the z-axis, The grid intervals on the x and y axes always match the rows and columns of the matrix whose elements constitute the bars being plotted. 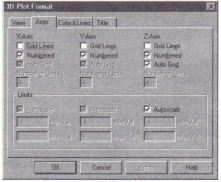 • To have Mathcad select the number of grid intervals on the z-axis, use the Auto Grid check box. When Auto Grid is checked, Mathcad will automatically select the number of grid intervals on the specified axis. By default, Mathcad auto scales the z-axis according to the range of values in the matrix you are plotting. Sometimes you will want to fix the scaling yourself, for example, if you are comparing views of related data or setting up a surface animation sequence. To set the z-axis limits manually, click on the Autoscale box in the z-axis column of the Axes page to uncheck it. 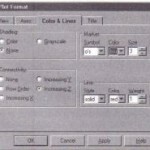 Then enter the maximum and minimum values in the Max. Val. and Min. Val. 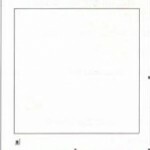 text boxes.